CityScene Media Group officially welcomed the newest member to its suburban publication family with the launch of Discover Grove City Magazine. The magazine, in partnership with the City of Grove City and the Grove City Parks and Recreation Department, is a celebration of all things that make Grove City a unique place to live. A launch party for the inaugural issue was held June 20 at the Eagle Pavilion at Rotary Lake in Fryer Park. Prominent community members and organizational representatives joined to hear remarks from CityScene Media Group President and CEO Kathy Gill and Mayor Richard L.“Ike” Stage. 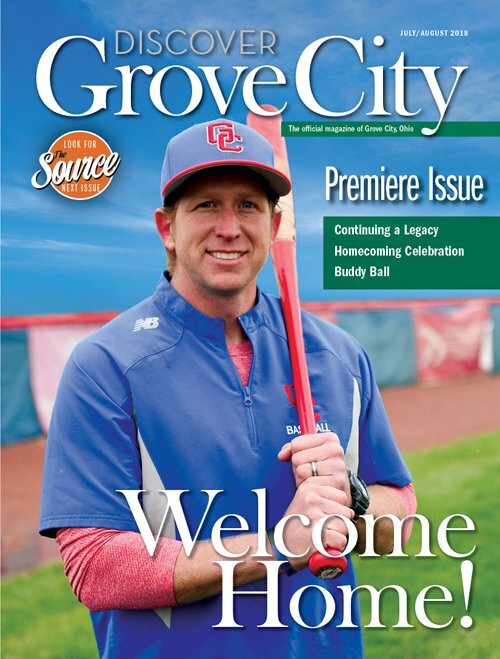 Ryan Alexander, GCHS teacher and baseball coach, was the first community member to be featured on the cover. Alexander was in attendance along with representatives from the parks and recreation department, local businesses and the school district. The Discover Grove City launch party was an exceptional start to what will surely be a strong relationship between the community and its official magazine. The cherry on top? A customized sheet cake from award-winning Capital City Cakes. Be on the lookout for the next issue of Grove City’s official community magazine this September, which will be the first of many issues to include Grove City Parks and Recreation Department’s event guide, The Source. There’d be no community magazine without the community. To all of those who live and work in Grove City, make your voice heard by sharing your ideas and suggestions for potential stories, event coverage and personality profiles with Associate Editor Jenny Wise. For Advertising opportunities, please reach out to Advertising Director Rocco Falleti. CLICK HERE to read the premiere issue of Discover Grove City Magazine!